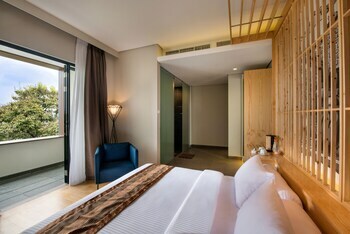 With a stay at Tama Boutique Hotel in Bandung, you'll be within a 5-minute walk of Istana Plaza and Living Plaza Bandung. Featured amenities include a 24-hour business center, complimentary newspapers in the lobby, and a 24-hour front desk. Free self parking is available onsite. With a stay at Airy Dago Dipatiukur Kyai Luhur 2 Bandung in Bandung (Coblong), you'll be within a 10-minute walk of Padjadjaran University and St. Borromeus Hospital.